' Roadie John 'Johann' Taylor's name changed according to the country we were playing in at the time i.e. Johanne Schneider (Germany), Jan Clearmarker (Holland) etc. Anyway, the name 'Johanne' stuck and I believe he is still called 'Johanne' today. The Patto yodel was started by Bernie Holland who's brother Chris (large) was also our roadie for quite a while. Before that we had Roger Manifold, Barry Bloar, Archie (an out of work actor) who was a useless roadie, but oh boy could he act, except for the part where he played a roadie. A really nice guy whose name was Dave and was from Swansea, much too nice to be a roadie for us bunch. 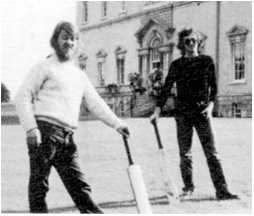 Brian Godding: There's tons of memories of those times, like playing cricket in Regent's Park every Sunday morning with the Patto's, Boz Burrell , Zoot Money, Bernie Holland etc.with cricket equipment on total involuntary loan from Manchester University. David Baxendell: I remember partaking of some great cricket matches in Regent's Park. The Patto team with extras - Mark Charig, Elton Dean, Nick Evans, Gavin Shaw, Boz, Barnabas and Eric Swain. The only pitch we could use was the one no-one else wanted and was on such a slope that Mike would almost disappear over the horizon to start his run-up. Wicked fast bowler he was, and Ollie's spin was impossible to counter. However, with the amount of dope and booze in the "pavilion" no-one really cared about the result. I also recall an evil soccer match in the pouring winter rain between The Patto Tripping Loonies and Zoot Money's Speedfreaks. Not being of a magnificent stature myself, If I got caught with the ball with one of Zoot's hairy gorilla roadies bearing down on me, I would abandon the ball and run away. Mike was definitely our best player, batting and bowling and fielding. OK for him, at No. 1 , But we tail-enders were so stonkered by the time we came in that the bat was mainly a prop to stop us falling into the wicket. Philip McCarthy: Mike was a really fast bowler. He used to practice bowling at one wicket. He played several matches on TV for a celebrity Norfolk team that included several Norwich City footballers of that era. He also played football for Norfolk schoolboys. He was a very fast , and played on the right wing. He was an outstanding athlete with many talents. He excelled at boxing. Mik Glasser: I always remember playing cricket in Regents Park and I was the awful yank who was the handicap dude. Mike was a great coach and always gave me latitude for my Nerdism. Going across the street to Gavin's on (almost) Baker Street was where I excelled at doing paperwork as taught by Boz. I really miss those days and Mike, Clive, Ollie, The Admiral, D the Rave, et al. 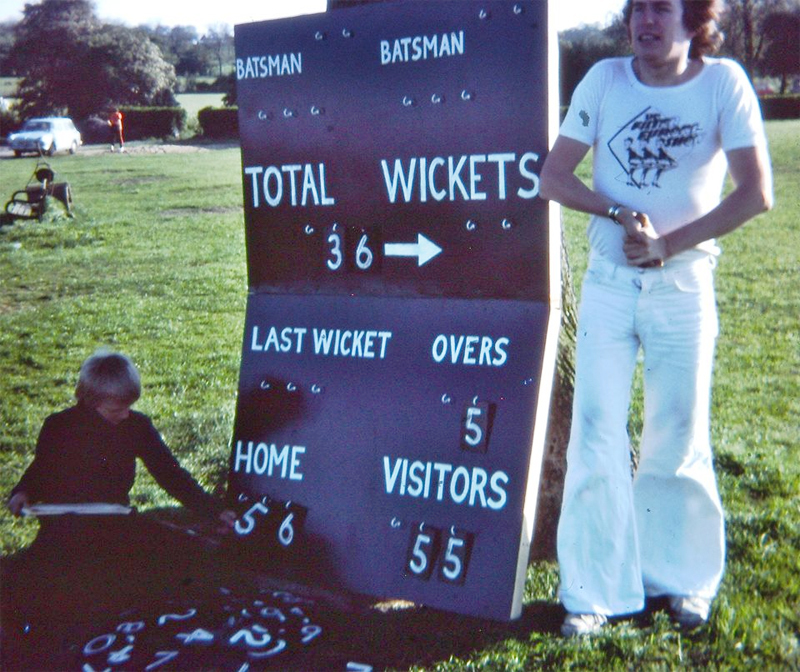 Bernie Holland: The Regents Park 'test matches' were a regular occurrence during the summer - Boz had a flat in nearby Allsop Place which we used as the 'Pavilion' I made a scoreboard on which the stats would be hung on hooks. Also there was the famous 'Acid Test' when we all (or most of us) dropped LSD - Zoot Money was present at this one if I remember rightly - Patto's bowling would strike fear into who ever was holding a bat at the time - sometimes it is a bit painful for me seeing all these pictures of Mike - who should still be here with us right now - not only was he a great singer, but he was a great wit and raconteur and above all a great friend who would never ever betray you - the loss gets greater with every passing year - sorry if I have gone on a bit here !